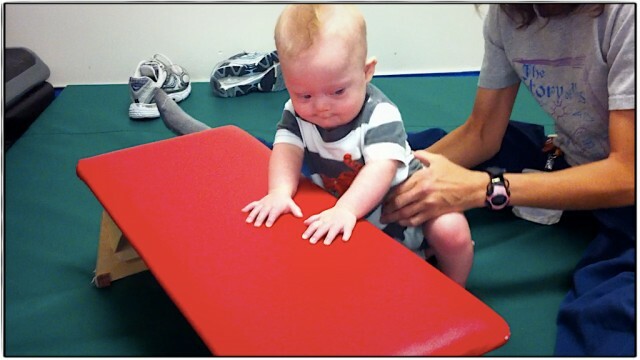 Noah Takes His First Step Towards Standing Up! 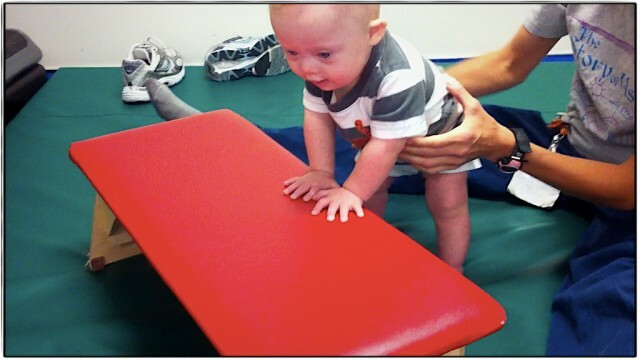 You are here: Home / Therapy / Noah Takes His First Step Towards Standing Up! Today was a big day for Noah at physical therapy. As you can see in the video he took his first step towards standing up today! We were thrilled! Pulling up is a huge milestone for any baby, and it’s fun to see Noah take his first steps toward being able to pull himself up on his own. It’s amazing how hard this little 39 week old baby works. We are so crazy proud of him, you have no idea. We are so proud of this little boy! It’s so much fun to see the look of accomplishment on his face when he achieves a goal like he did today. As his parents we go bananas every time he wins. No matter how big or how small….we celebrate wins in this house!We are very thankful to have such a great physical therapist that believes in our son, and is committed to helping him grow into the person God created him to be. Noah can stand tall because of all his hard work! I’ve said this a million times, but let me say it a million and one…I love being this little boy’s dad. Yeah for Noah! That is awesome. We are still working on our daughter sitting on her own. We are starting to get close. I remember when it seemed like forever before she could hold her head, then to push up on her arms, now sitting is our current goal as well as being up on all fours. I think having children with DS lets us as parents focus on things the average parent takes for granted. We truly get to enjoy the miracles that our children are. Wow..that’s BIG NEWS!! Thanks of reshaping that. Noah is just now starting to hold his own bottle also. We love holding him, but man it’s nice to see him finally be able to feed himself. What a great goal! wow, he is so adorable! He actually reminds me of my oldest son when he was little. The blonde hair. Our second son was 7 wks old when we adopted him, so this brings back memories. He is 3 yrs. old now. A few months ago, our church was sending a group on a mission trip to Mexico in it’s ancient bus that always breaks down (seriously, at least once every trip). The pastor at church made a request during service that everyone pray for the bus. Warren didn’t like the Sunday school, and we’ve since switched to another church, but he would sit with me through the service (quiet and totally still). Anyway, at prayer time that night I started to say prayers (Warren bows his head but has me talk) and when I got to amen, he freaked out. He kept saying “NO!” and “Bus Mom bus!” It took me a couple minutes to figure out through the whining that he wanted to pray for the bus going to Mexico. It’s the first time he’s ever asked to pray for something specific like that and it was awesome! And the bus didn’t break down! Samantha has been able to reach out and hit the toys on her gym. A big yeah, as she wasn’t looking to have much cordination with her upper body. But we have worked with her daily and it’s paying off. And that is great about Samantha. How old is she by the way? I keep thinking how fun that would be. What are their age differences? Virginia is our oldest at 8 Shelby will be 3yrs on Wednesday. We have completed our family with Samantha. I think it’s great having 3 girls and hope they grow up and have that sister bond. Hopefully you will be blessed with siblings for Noah. He is ADORABLE!!!! Wow. I just want to say thank you. I’ve only had time to peruse a small amount of your blog, but what I have seen fills me with joy. I’m so appreciative that you have presented your heart and soul in your son and given the world eyes to see his accomplishments. They are well worth proclaiming. WOW! That is great! All that therapy is really helping him. Andrew is 14 months and receives 30 min. of speech, 30 min. of OT and 1 hr. of physical weekly. Just recently he has begun feeding himself! He loves goldfish crackers and cheerios (dry foods) but with wet foods, Gerber diced apples, green beans, he usually grabs several of them and then finally one makes it to his mouth. For the longest time, he would just pick it up and stare at it, then drop it on the floor 🙂 He is still using a bottle…it took him a long time to hold it on his own, but what helped him is a bottle that HEB sells that is indented so that he can grab it…the others are rounded, so he couldn’t hold it very well. If you look at the bottle from the top angle, it has a shape of a cross or plus sign. My four year old used this bottle as well when she was younder (typical development). She drank from a sippy cup at 15 months, but I know it will be a long time until Andrew is there….we have the Honey Bear Sippy cup to help with that….but one milestone at a time, right? Well, I’m from Haslet (a little town north of Ft. Worth) but I’m currently a junior at Baylor so I spend most of my time in Waco! Wow! What an inspiring story. This blog is an awesome record of the love you & your family have, as well as Noah’s accomplishments. You should be proud! And we are VERY proud. Thanks for your comment and for following our sons story. Wanted to say how much I appreciate your giving us a glimpse into Noah’s life, especially details about physical therapy. I work with adults who have various developmental disabilities, so we see only the results (or lack of results in some older folks) of early childhood physical therapy. Its so helpful to be able to see what they and their parents have struggled through. Thanks for sharing! Mine are much older, but I still like to brag. My girls have been terrified of rides, it took them forever to use a swing. At our local mall there is a merry-go-round. In the past week and a half, Allison has riden the merry-go-round twice on a bench type seat mastering the fear of the circular motion and Alyssa has riden it once on the bench and once on a horse, mastering both up and down and circular motion. Way to go Noah!!!! The world is just beginning to open up to you and oh the things you will discover. I remember when my son Casey first learned to pull himself up to a standing position…what a wonderous moment! my Arbi finally started to reach the toys moving above his head in the relax and also reaching things when he is laying aside 🙂 he is 4 months and 10 days old. Way to go Noah!!!! You rock!!! Keep up the excellent work! Practice, Practice, Practice! It pays off!!!!! Claire is walking great one-handed and will stand for brief moments by herself! We are so excited at all of her progress!!! Also, she eating good with her utensils. Of course the fork is much easier than the spoon! We are sooooo proud of her!!!! Love your blog and all your posts! As you can see, today Papa is off so I am catching up on your blog. It is so much fun to see Noah do so well. We do use your videos to get ideas on how to do PT at home (play to Enzo). Boy, if we see one more cool toy , we might have to make a run to the mainland and buy it! HA! We love the videos. Noah is doing so well! he is so adorable! He actually reminds me of my oldest son when he was little. The blonde hair. Our second son was 7 wks old when we adopted him, so this brings back memories. He is 3 yrs. Well this is stuff we are working on with James. I need to find the perfect thing for him to pull up on.! Love watching your posts I get so many great ideas! Always great to see him doing more. Just had a thought that with DS kiddoes having less stability with their ligaments, they need to have orthotics to keep their feet and ankles in the proper position. Even if the kids have a lot of strength, their ligaments don’t tighten up like normal kids do which made my son act unsure and slow in trying to go up and down stairs. Jim wore them with low ankle support but now just wears inserts. I just wish I had gotten them at an earlier age so I thought I’d mention it. Way to go little guy!! Noah you are a true inspiration. My son was born 2 weeks ago today. One month premature and with DS. Talk about making an entry. It has been a whirl wind but reading about you has truly helped me realize that our little fighter still in the hospital is truly a blessing and the most beautiful gift from god. I love reading about u especially on these sleepless nights.